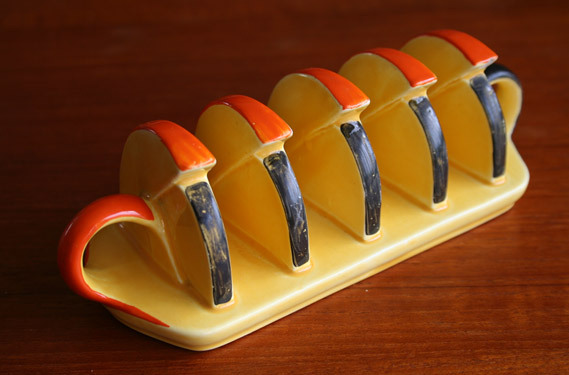 This hand painted toast rack in a typical Art Deco shape from the 1930 even works with my 60s Melamine egg cups thanks to its cheerful colour scheme. Not to everyone’s taste but I love it. Carlton Ware was another Stoke-on-Trent based pottery manufacturer. The company is best remembered for the ceramic toucans it made as promotional items for Guinness. It reached its artistic high-point with superb hand-painted domestic pottery in high art deco styles during the 1920s and 1930. This entry was posted in Art Deco, Dining and tagged Art Deco, Carlton Ware. Bookmark the permalink.